Well I’m back form camping in the northern reaches of Ontario, Canada….what a beautiful area..
Hi all, I hope you are having a wonderful summer and enjoying the additional freedom of movement that warm weather offers to our joints and bodies through our yoga practices. 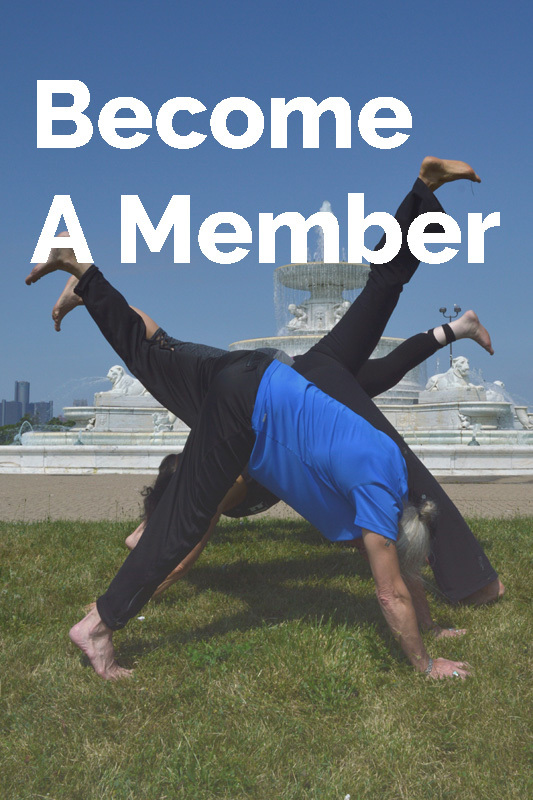 I wanted to pass onto you a offer from member Ann French,who is in the process of completing a yoga therapy internship. 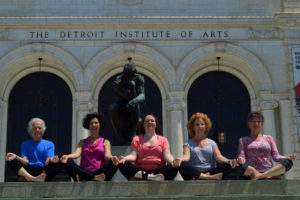 Ann is offering a free therapy sessions which will consist of guided meditations’ few yoga postures and related actions. Minimum of 3 or 4 sessions is usually needed to see any results. Yoga therapy is not a yoga class, but is a form of alternative or complementary medicine and is about giving the individual tools to heal themselves. Healing is not only at the physical level, but also emotional, mental, and spiritual. She will give you some suggestions based on what she finds, but for it to work, the individual will need to do what she suggests. Saturday was Kathy Schaefer’s Breath and Bones workshop at Mercy Center in Farmington Hills. The gloomy day was perfect for huddling inside and learning something new form one of our local YAGD teachers, hooking up with like minded people, learning more about our bones and breath to share with our students. It was definately an experiential approach to learning, which allows us to experience a move in our body first so we can then take it to the classroom. Thanks Kathy! Well we did it!! on July 1st 5 of us got together with Randy Cardona, our professional photographer. 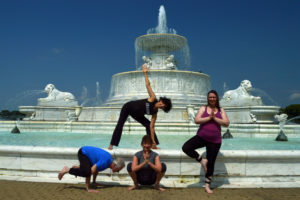 We met at Belle Isle’s Scott fountain and began our adventure to take as many photo’s at Detroit landmarks as the day and time would permit. We had a great time, even with the 90+ degree weather and a strong wind. My thanks to volunteers, Vince Spadacini, Diane Kinaschuk,Sharon Holcomb and Jennie Kurth. Randy has been excellent to work with and very responsive to our needs and requests. My plan is to use the photos on our website and for future advertising for YAGD. Below are a few of the photo’s taken. 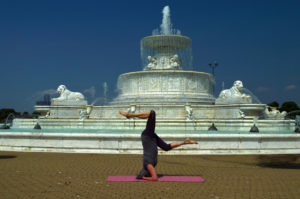 Chela-Yoga is located in Waterford Michigan. Stop by and visit or check out their website! For the first time in the MidWest! Scientists have concluded that the universe extends to infinity, but this infinity can never be seen. Hidden within the Vigyan Bhairav, a remarkable 5,000 years old text, are 112 techniques to experience infinity within oneself. During this two-day immersion, global peace leader and spiritual master Sri Sri Ravi Shankar will unveil the subtle secrets in this powerful text. Many experiences in life have enabled us to transcend to a different space and state of mind. Unveiling Infinity with Sri Sri Ravi Shankar enables us to uncover the ability to achieve this state at will and on a regular basis. A very rare opportunity for all our Yogic practitioners to meet a living Guru with so many lives he has touched in the entire Globe and to learn something ancient yet very New directly from Sri Sri. Sri Sri will be decoding this ancient text to all of us guiding us through these profound Meditation techniques. It is with much pleasure that I announce that Mihir, who joined our organization at our June picnic, has volunteered to take over Merchandise handling from our dear friends Vince and Pat. Mihir has also agreed to be my back up or “Alternate Corresponding Secretary”. He is skilled in computer applications and eager to support the organization. He is also a member of The Art of Living organization which is a non profit 501 c3 like ourselves. 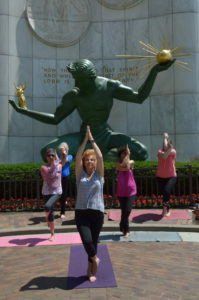 They are having a huge event July 7&8th at the Renaissance Center in downtown Detroit. Here is the information: It will also be posted in our “Workshops Events” on our website. Please check it out and let people know about it.